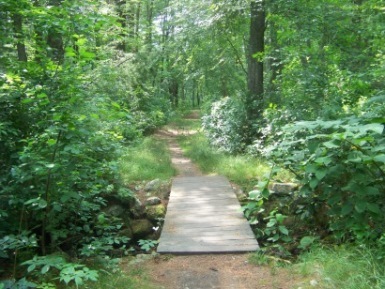 Abington, a town in the middle western sector of the south shore hiking trails. This town can be reached from Boston by heading south on route 93 and then merging onto Rt 3 south heading toward Cape Cod. Exit Rt 3 onto route 18 heading south again. The Abington border is approximately 3 miles. Abington can be a town of traffic as there are 4 major routes through this town (Rt. 18, Rt 139, Rt 123 & Rt.58). a tour through the town helps support this fact. route as we will see. Abington was settled in 1668. Though there were many holding trusts of land there was only one actual settler in town, Andrew Ford. Abington is a town that has been highly influenced by the Indians that laid claim to the land, yet records show that even they did not use the area as a campsite. 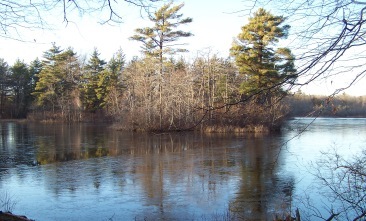 The Algonquins and Wampanoag Indians both laid claim to the area which led to disputes. Apparently neither could use the land without a battle. Once white settlers came, the plymouth county then purchased the land from the Indians. It was the Algonquin influence that was the greatest in the area. These Indians referred to themselves as Massachuseuk or people living near the great hills (blue hills). 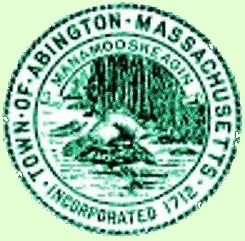 They are also responsible for giving Abington the name of Manamooskeagin which means great green place of shaking grass this name has been incorporated into the town seal. One very great influence that exists to this day and probably helped settle this town early was the existence of a major Indian trail running through the town. What is now present day Washington st and Adams st was once the Satucket trail. Heading north it led to the area of Wessagusset in North Weymouth. When the town was first settled it held the towns of Rockland, Whitman and parts of Hanover within it's borders. All were part of the town of Bridgewater. Abington first petitioned to be incorporated as a town in 1706. They were denied as one of the requirements to become a town were to support a church and it's minister. By 1712 Abington had 20 families living here and were able to fulfill this requirement. Abington was incorporated on June 10, 1712 and thereby separated itself from the town of Bridgewater. The earliest industry in this town were the saw mills which helped the community to grow as they provided the materials to build homes. By the mid 1700's a number of tanneries popped up around the town. These were the early fore runners of the boot and shoe industry. Again the population grew because of the abundance of work in the area. Abington had started with one school house in 1732 more did not come till 1755. At that time 5 school districts were added each with a school of it's own. By the 1800's the shoe and boot manufacturing industry had exploded and by 1822 the town added 3 more school districts. In 8 short years 3 more had to be added for a total of eleven. Meanwhile the shoe and boot industry became busy providing footwear for the soldiers of the civil war. It is estimated that the town of Abington alone provided nearly 1/2 of all the footwear needed by the union army. It was also estimated that there were 36 shoe, boot or shoe and boot manufacturers in town at that time. In 1758 one of these shoemakers Lyman R. Blake patented the first machine to sew the soles to the uppers. This of course lead to faster production and the small shops that had hand sewn these boots now consolidated or were bought out by large factories. By 1781 the town voted to build a school in each section of the community. With the tremendous growth and industry brought on by the shoe industry the areas of East and South Abington had become villages of their own. When it was agreed upon to build these schools each district had a budget in place for the building project. All the areas had kept within their budget except for the center of Abington. They far over reached their budget and then refused to pay the bill. The builder then sued. The "villages" wanting nothing to do with this business saw for their opportunity to separate. The issue was debated for three years and then in 1874 East Abington separated and became Rockland and a year later South Abington separated and became Whitman. Abington is also noted for a riot that was held in the area of Arnold's park (where one of the large shoe manufacturers was). This riot held in 1893 was between the constables of the town and the workers of the railroad over the towns right to run a street car line over the rail road tracks. Well maybe that wasn't so brief but certainly interesting. Unfortunately Abington doesn't have a town forest, but what it does have is a state park! Ames Nowell is the place in this town with largest selection of hiking trails. You could spend several hours exploring the hiking trails in this park. Another activity that seems to be growing in popularity here is mountain biking. The trails of the state park let out to a power line that lends itself quite nicely for some great mountain biking pursuits. Trails of all sorts continue across the power line into the deeper parts of the forest at this state park. 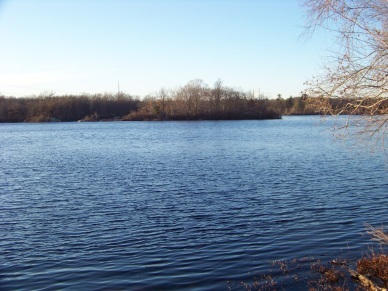 There is a sizable pond named Cleveland Pond that contains several small islands. Another possibility for exploring! The official DCR website (and others) claim that Ames Nowell is a popular place to boat, yet I rarely see anyone out in this pond with a boat. That is a shame as there is much to see and do in these waters. Boating is non motorized and you will need to carry your choice of boat to the ramp area. Don't worry though, it is a short walk to the boat launching area from the parking lot. What is big at Ames Nowell besides dog walking and hiking trails is the fishing. Almost any day of the year you are most likely to see someone fishing on this pond. Winter ice fishing is probably the most popular of all here. If the pond is not covered over by snow, ice skating is another good choice for winter recreation. Several of the hiking trails are the size of dirt roads making cross country skiing another great winter activity. Till recently the hiking trails of this state park just existed and there were no markings of any sort. Recently there seems to be an effort in much the same way as the blue hill reservation where numbered markers at junction locations are being put in use. There seem to be no actual trail names as of yet though there are many hiking trails. If you use the link above to access the page about Ames Nowell, there is a link on that page to the official trail map of the DCR. Below you will find a map that I have revised and attempted to categorize some of the usual or important hiking trails in this park. The DCR map in it's original form shows three trails leading to North Quincy St on the Abington/Brockton line. The middle one now fades off as it leads to a Condominium complex that was built after the map was made. The developers of this complex must of either not known of Ames Nowell's trails or decided it wasn't important to it's future residents as the road wide trail was covered over. There are three hikes that I will describe and give my own names to till the park decides to officially name them. 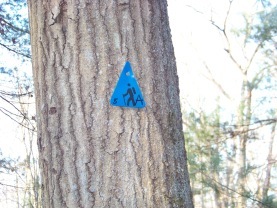 Dog Walk Trail is shown in Green. This may possibly be the most used hiking trail route in the park. It's a good start to getting to know this state park. Boardwalk Trail is shown in Red. 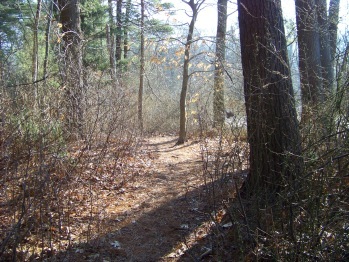 This is the trail to the lesser used older boardwalk. Around Cleveland Pond Trail is shown in and uses Blue and Red. 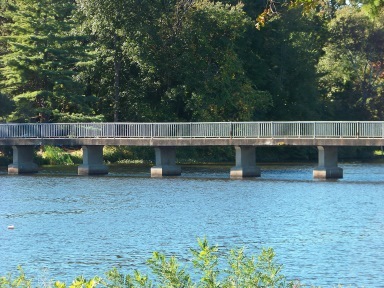 On the northeastern side of Abington are the hiking trails at Union Point, the former South Weymouth Naval Base lands. 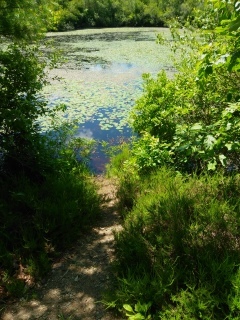 The Thompson Pond Trail skirts along the pond on the Abington side of Union Point.